The President of the Galician region (Xunta de Galicia) , Alberto Nuñez Feijóo, along with the counsellor of Economics and Industry, Francisco Conde, visited Delta Vigo’s facilities at the Technological and Logistical Park of Valladares, in honor of the inauguration of Delta Carbon Fiber Technologies, the new division of Delta Vigo. “This is one of the most important companies of Spain and Europe,” emphasized Feijóo during the presentation. The Galician President stated that the Xunta will lead the Galician aeronautic sector, for which Delta offered its collaboration. Delta Vigo, founded 67 years ago, is specialized in high technology solutions and automation of manufacturing processes for various sectors, especially for automotive and aeronautics. 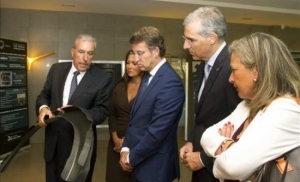 It has two plants in Vigo, one in Peinador and another in Valladares, from where it carries out the processes of R&D, engineering, industrial automation, robotics and production of equipment for industrial processes and production lines, among others. It also has another factory in Illescas (Toledo), where it manufactures airplane components from composites.